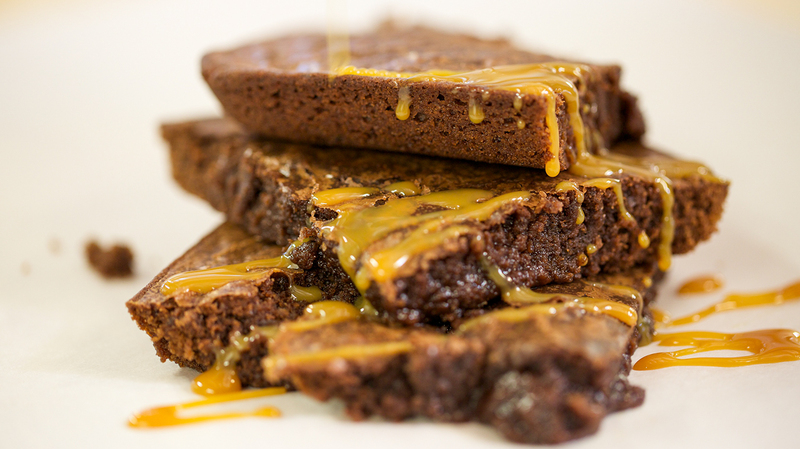 Homemade brownies are the best thing to whip up because you don't miss out on taking the first warm, chewy bite! Combine sugar and butter in a medium bowl. Add eggs and Madagascar Bourbon Vanilla, stir until combined. Combine flour, Nesquik, baking powder, instant coffee, and salt in a large bowl. Stir the sugar mixture into the dry ingredients. Pour into prepared pan and bake for 18-23 minutes, or until a toothpick inserted in the center comes out slightly sticky. Cool in pan and cut into bars. Top with Crema di Salted Caramel Syrup and serve. Try to refrain from crying tears of joy.